Yay, it’s FRIDAY! I don’t know about you, but Friday could not come quick enough for me. Maybe it was the three super hard workouts in a row early in the week. Or maybe it’s just the fertility meds I’m on, but I am wiped out! I came home from work the other day and just slept for a few hours! And I’m a zombie at work. Just barely making it through the day. Or maybe it’s the heat. I don’t do well with the heat. I hate it. I’m uncomfortable. And I basically just stay inside in front of the a/c until the thermometer drops below 80 degrees. Any higher than that, and I just can’t do it. Well, there is one exception, and that’s if I happen to have a nice cool treat. Kind of like the one I’ve decided to share with you today. I know I’ve told you about my obsession with coconut, when I brought you my Almond Joy Gooey Rolls and then there was the Pineapple French Toast with Coconut Syrup (that I basically just drank from the spout). I didn’t necessarily mean to bring you something coconutty again, but I kind of can’t help it. In my world, most delicious treats include coconut. 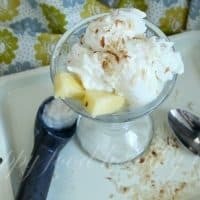 One of my favorite cocktails is a pina colada, and because I’d much rather be able to share my sweet treats with my kiddo, I had to take those pina colada flavors, and create something a little more family-friendly. Small pieces of pineapple. 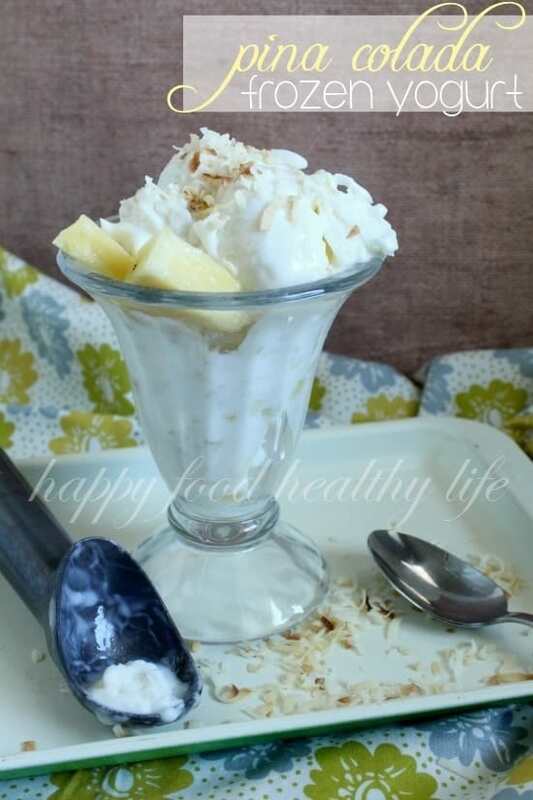 Coconut extract and flakes of coconut. Macadamia nuts for some crunch and a bit of an island feel. All mixed in with some low fat yogurt and churned into a frozen treat. That is the kind of treat that gets me on board with summer and all the extreme temps! I hope it gets you in the mood as well! First of all, be sure your ice cream bowl has been frozen ahead of time so it's ready to go. Combine all ingredients in a large bowl. Once mixed thoroughly, place all ingredients in the frozen bowl of your ice cream maker. Turn on and operate according to your ice cream maker's instructions. Churn until desired consistency. Either eat right away or freeze in a freezer-safe container until about 30 minutes before serving. Set it out to thaw if eating at a later time. 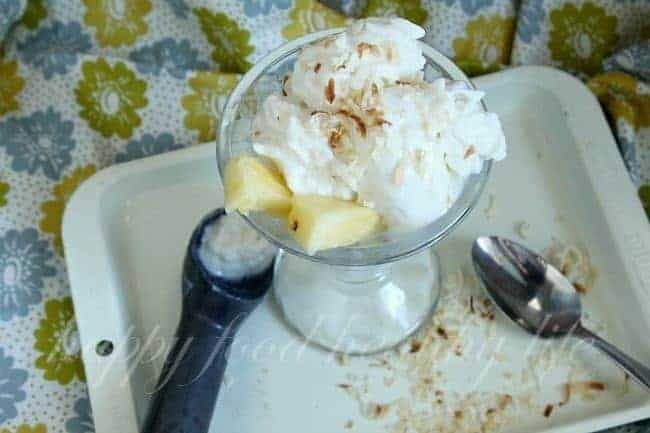 Feel free to garnish with fresh pineapple and toasted coconut. looking for other cool treats? Mmm, pina colada! I love that I too can share my favorite drink with my kids with this dessert! I am a fellow coconut lover! This is wonderful Holly! My kiddo LOVED it just as much as I did! I swear, more and more of my recipes are a pineapple + coconut combo… or at least coconut. I just kinda can’t help it! I love Pina Coladas.. This looks so good, and not too much work. I definitely will give it a shot! You’re right, Kim! These are really SO very little work! This sounds great. I need to try making frozen yogurt for my girls. They would love it! And you would be shocked at how easy it is!! This look sooo good & refreshing! Love that you added the macadamia nuts. Thanks for sharing at Pin It Thursday! !